Peruse the trade literature of the meat industry and you'll find that of all the forces currently arrayed against the livestock industry none evokes as much vitriol as the Humane Society of the United States (HSUS). Flipping through Pork magazine, Feedstuffs, or Meatingplace, it becomes clear that, as one Cassandra of carnivorism put it, "no activist group is more loathed by the agricultural community than the Humane Society of the United States." Pork has described HSUS as "a well-oiled, well-funded lobbying presence with a finely tuned message machine" and has quoted a consultant as saying, "HSUS is sophisticated and relentless in their dedication to defeat animal agriculture practices." Such assessments are music to the ears of Paul Shapiro, vice president of farm animal protection at HSUS. Shapiro spends his days lobbying for costly reforms that would eliminate inhumane methods of animal confinement. As Shapiro sees it, industry blowback is to be expected and, in a way, even welcomed as an affirmation of his advocacy. It's always nice to know when your arrow hits the intended target. Less expected is the barrage of criticism that comes from the "abolitionist" wing of the animal rights movement, which views HSUS welfare reforms as craven capitulation to industrial agriculture. The rift dividing HSUS from this vocal wing of the animal rights movement might seem insignificant, but it's not. In fact, it requires that animal advocates confront a challenging question: Does HSUS, in its ceaseless quest to improve living conditions for animals within factory farms, justify and perpetuate the ongoing existence of those farms? In other words, does it perpetuate the harms that it also reforms? There is little doubt that HSUS is doing something right. A complete citation of their recent accomplishments would be too long to list here, but consider that HSUS has worked to eliminate cages that confine pregnant pigs so tightly they cannot turn around. In banning this torture device from their supply chains, these companies joined industry kingpins McDonald's and Smithfield Foods in yielding to Shapiro's ceaseless nagging on behalf of a barnyard proletariat numbering in the billions. This is just one example of the kind of improvements HSUS routinely initiates and sees through to completion. Nevertheless, as the abolitionists correctly point out, there's nothing especially revolutionary about HSUS's approach to improving the lives of farm animals. HSUS works closely with Big Agriculture, never explicitly calls for animal liberation, and does not aggressively endorse the most effective solution to the suffering of farm animals: veganism. 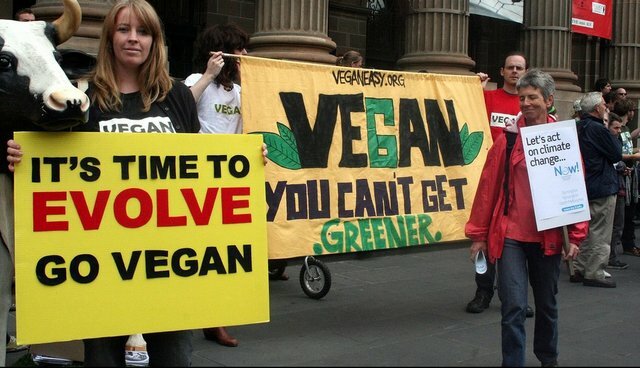 This reticence infuriates abolitionists, who seek the eradication of not only animal agriculture but also all animal ownership and exploitation through ethical veganism. That is just plain silly. "Enriched" cages involve torturing hens. Period. The torture may be slightly "better," just as padded water boards may be slightly "better." But let's be clear: the hens will continue to be tortured. And they will continue to end up in a slaughterhouse. Francione has a point, but his extreme take on the issue is unlikely to resonate widely in a population that's only 1.4 percent vegan (and a population in which there are more ex-vegans than vegans). According to social psychologist and longtime vegan Melanie Joy, the abolitionist approach could attract a lot more supporters if it acknowledged, as HSUS does, that most people are going to embrace veganism on their own-you can't strong-arm them into it. Joy, author of "Why We Eat Pigs, Love Dogs, and Wear Cows," believes that social change - in this case, honoring the intrinsic worth of animals by not eating them - is a complex process requiring both an awakening to the hidden reality of exploitation and the individual will to act upon that awareness. Asking people to stop eating animals, as Joy sees it, is more than asking for a change in behavior; it's asking for a profound shift in consciousness that people make only when they're personally ready to do so.